with Actors and director tailor made for the needs of your students. It’s the mid fifties, society is trying to find itself, what should be a time of peace is shook by rebellious new attitudes. Why should the traditions of the past dictate the generation of today? 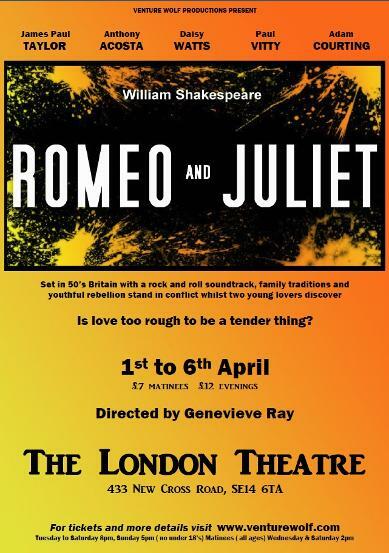 Set in an era where family traditions and youthful dreams stand in conflict; Venture Wolf present an action packed, funny and tragic new production of Shakespeare’s classic romance. With a rock n roll soundtrack the Montague boys hit the town and cause havoc at Capulet’s sophisticated party. Old rivalries return to the surface and playful masculine violence spills to the street, will two young lovers desire for each spiral the battle between families into a dangerous game of life and death?